Coachella – the desert based festival filled with endless celebrities, musicians and social media influencers. It’s fair to say that, whilst Coachella has consistently dominated headlines each year, Beyoncé’s performance on Saturday made history as she was the first ever African American woman to headline the festival. 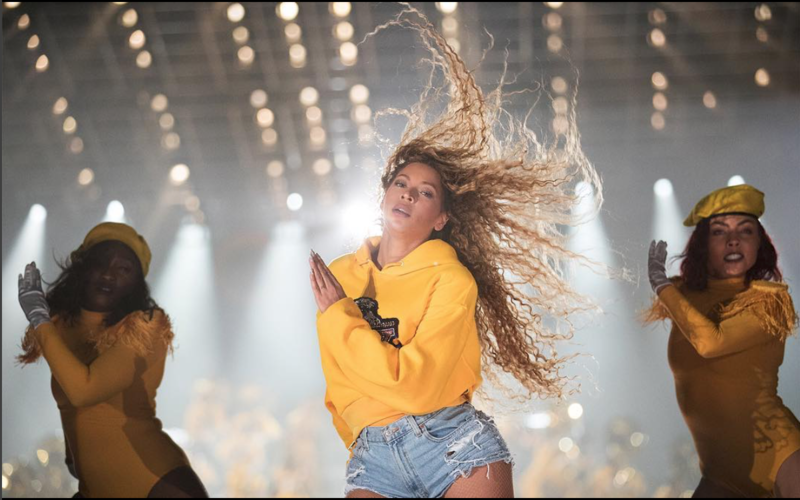 The singer’s performance had such an effect on those watching on the live stream and in person, that the festival has been renamed by fans and referred to as ‘Beychella’. Creative Director of Balmain, Olivier Rousteing was behind the creation of all five of Beyoncé’s outfits, as well as those for the ensemble of around 200 musicians and dancers. Rousteing’s Balmain is all about bringing out the strength of women by presenting the supermodels walking in the runway shows as a part of the ‘Balmain army’. It is for this reason that Rousteing is the most fitting creator to design for Beyoncé, one of the most powerful women and business women in music. Out of the five outfits worn during the performance, Beyoncé’s first outfit confirmed and asserted her status as what the Beyhive would call her, a Queen. Rousteing created a black and gold Egyptian-styled body suit with a cape. The second outfit of the night resembles the most militaristic look, as Beyoncé wore a cami print body suit to perform with Kelly Rowland and Michelle Williams as Destiny’s Child. In an interview with Vogue, Rousteing stated the reason behind these looks, as informed by Beyoncé’s stylist, Marni Senofonte. He states, “Marni told me that the shows were all about survivors and that B was looking for something in a military style. Our silhouettes and our sort of Mad Max, futuristic take on military looks for Fall were a perfect fit”. In accordance with the theme of ‘high school band’, Beyoncé’s third outfit consisted of a yellow sweatshirt, denim cut offs, fishnet stockings and of course the sparkling Christian Louboutin fringed boots which tied the look together. The fourth outfit represented best by Beyoncé’s alter ego, Sasha Fierce, was a head to toe black patent leather look. The outfit consisted of a body suit, motor cycle jacket and thigh high boots. The final outfit seemed the most playful outfit, where Beyoncé kept the patent leather thigh high boots and paired them with a mesh t-shirt. Reflecting on this creative collaboration, Rousteing talked to Vogue and highlighted a moment from creating for Beyoncé. He states, “I think the thing I will always remember is sitting on the floor with B and cutting fabric,” he says fondly. “Blue comes in and runs over to B, and B holds her in her arms while talking to us about the cuts and silhouettes. To me, it was just such a beautiful moment because here you are with this megastar but also, she is a strong woman and a loving momma to her daughter”. Through this performance, Beyoncé and Balmain have shown the power of collaboration and synergy between different creative fields – and have made looks turn into special moments.